“I’m more into science than geometry,” says Spoke SLO Master Colorist, Angela Romero, referring to how she gravitates to color work over cutting work. Last year, however, Angela decided to hone her cutting skills by spending significant time at Spoke & Weal in Los Angeles with Spoke SLO co-owner Jon Reyman, an authority on cuts and movement. “Jon and Christine [Thompson, also co-owner] support the education of each stylist no matter what we want to focus on,” she says. 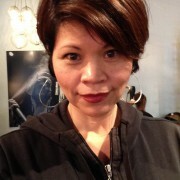 A native of Palm Springs, Angela has spent eight years at Spoke SLO and is an Aveda Haircolor Trainer. She’s worked behind the scenes at New York Fashion Week multiple times, as well as several runway shows in California, including those at the Academy of Art University in San Francisco. Even at the top of her game, with a full client load at Spoke SLO’s Broad Street location, Angela doesn’t take training and education for granted; if an opportunity to learn or sharpen a skill arises, she jumps; hence spending many of her weekends in Los Angeles with Jon Reyman. 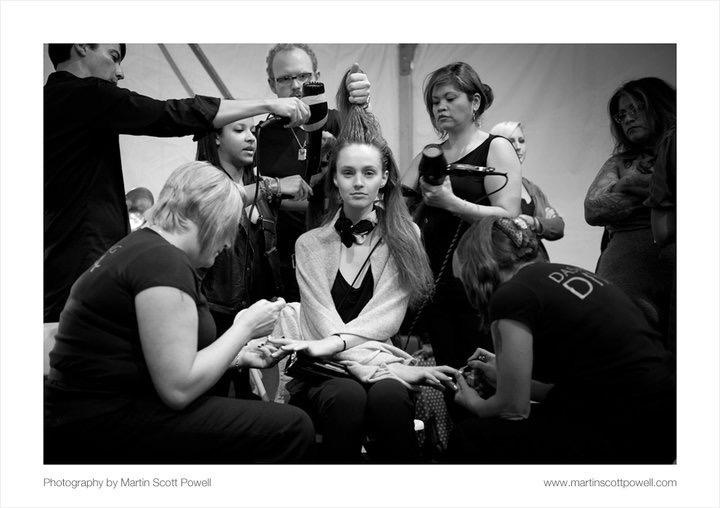 Angela (with a hairdryer on the right) backstage at a runway show. Angela appreciates the uniqueness of the team atmosphere at Spoke SLO, joking that “If you raise your hand to help with something here, you’ll definitely end up doing it!” To that end, she manages purchasing and merchandising of all Aveda products at both the Court Street and Broad Street locations. To book a consultation or appointment with Master Colorist Angela Romero, please call 805.781.6188 or book an appointment online here.